Perhaps I wasn’t being entirely truthful when I said last month that I did not have any photographs of my paternal family (see Begin Again). Some years after my father died, my mother came across a handful of old snapshots in a battered leather wallet, one of which was recognisably a small black and white picture of my English grandparents flanking their first car (a retirement treat) on a day trip to Hayling Island. The other photographs, however, were disappointingly of unknown friends and colleagues. But one of the pictures fascinated me in particular. It was the only hand-coloured image in the collection, and showed five boys under a tree, relaxed and grinning at an unknown photographer, long pointed sticks in their hands. On the reverse was written in faded blue ink: Expedition to East Coker Woods, Whit Monday 1944. It was not difficult to locate my father (to the far right) and my future uncle (through marriage) behind him. 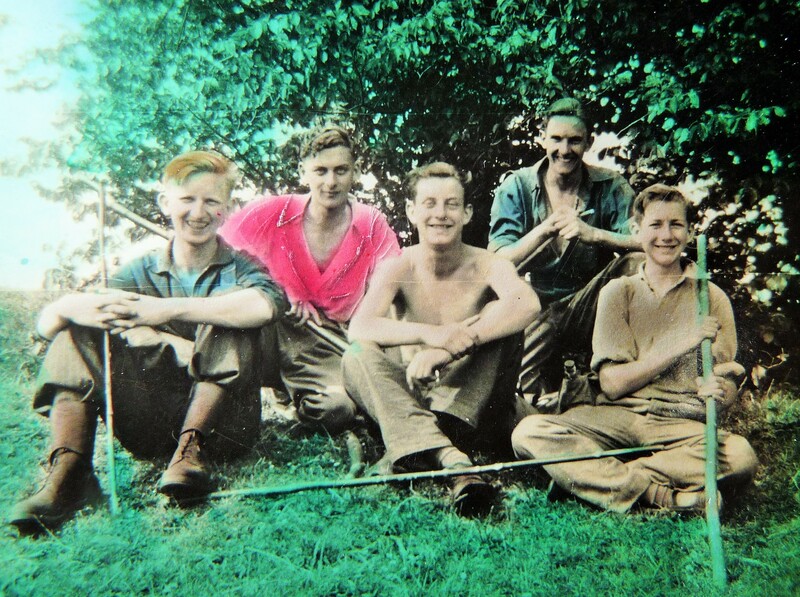 From the date (my father was born in 1928) I knew the boys were all most likely teenagers, but their old-fashioned clothes and obvious pleasure in their bank holiday outing made them seem much younger. In fact, such was the incongruity of the image that I was instantly reminded of Dennis Potter’s Blue Remembered Hills, set in 1943, where a group of children, played by adults, set off to play in the Forest of Dean, with tragic consequences. I had even watched that film with my father, who was normally averse to anything by Dennis Potter. That must have been taken when Dad was an evacuee my mother explained. He was sent to Somerset. I think his mother’s family originally came from somewhere near there. But wasn’t the place called Yeovil – not East Coker? I remembered the name because as a child my father had occasionally told me stories about the time he’d spent there during the war. He told me about collecting newts in jam jars, about raiding birds’ nests for eggs (something of which he was later ashamed), about hunting for shrapnel in the lanes. When I grew older, he added other tales to his repertoire: the dances in the village hall, drinking scrumpy straight from the farmer’s barrel, shooting rabbits. When I finally asked my father where this village was, all he said was that it was called Yeovil. To my Scottish ears the place sounded exactly like the kind of mythical English village of perpetual idyllic summers, where hollyhocks and sunflowers towered high above the inhabitants, and children were free to run through woods and fields and lanes. I pulled out the AA drivers’ map circa 1988 that now had little use in a family of non-drivers. Once I located Yeovil it wasn’t that difficult to find the Cokers (East, West and North – where was South?) standing to the south-west of Yeovil like sentries. But there was something else about the name that seemed vaguely familiar. It niggled at me for days before I later came across the Eliot poem – part of the Four Quartets. I thought it strange that my father, who loved poetry, had never bothered to tell me about the village and its link to Eliot, particularly when I had studied the writer so intensively for my English ‘O Grade’ exam. My 1941, 1st edition, 5th impression – originally priced at one shilling. 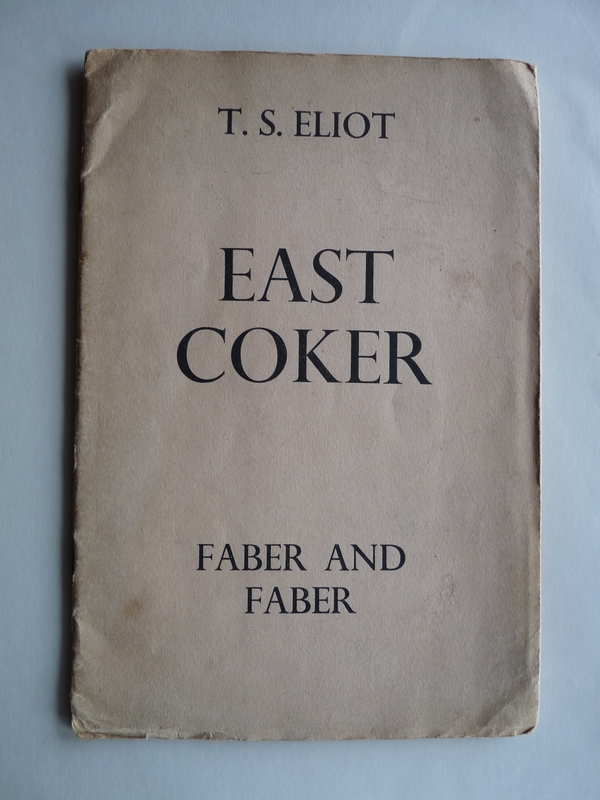 As we were growing up, my father had given my sister and me an eclectic mix of poetry books, from Seamus Heaney’s North to Hillaire Belloc’s Cautionary Tales for Children, and he must have been aware of the connection Eliot had to East Coker. Although the poem had been first issued in pamphlet form by Faber and Faber in 1940 (and reprinted several times, such was its popularity), the Four Quartets was not published until several years later. So my father would have certainly heard about the poem at some point. It was almost as if he had never wanted us to know the exact location of the place which had taken away so much with one hand (his home in London; his coveted scholarship to the posh school in Dulwich), but had bestowed gifts with the other (love and respect for nature; an appreciation and understanding of the British countryside). 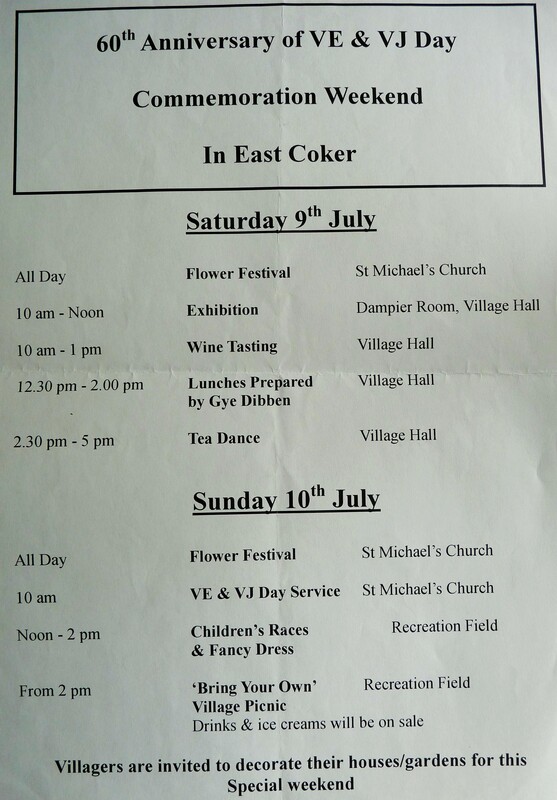 A few weeks later I came across the on-line East Coker Newsletter while trying to find out more information about the village. An announcement proclaimed that there would be special events set up to commemorate the 60th anniversary of VE and VJ Day during the second weekend in July 2005. This seemed to resonate with my plans to visit, and I knew then that I had to make the trip. What I couldn’t realise then is that the date of my first visit to East Coker would forever be linked in my mind with the London bombings. That weekend was due to be hot, and as my mother and I boarded our flight on the morning of July 7th we were oblivious to the horrific events unfolding in the capital. But the news soon filtered through to us, and in the end we were unable to leave our luggage in the centre of Bristol to look round the city as we had planned, so we simply took the next west-bound train and ate our limp picnic in the stuffy compartment while the ticket collector nervously prowled the corridors, checking and re-checking for any stray luggage. As we watched the lush West Country scenery slip past, it was hard to imagine the scenes of carnage in the capital – just as it must have been difficult for those who moved from London to the countryside for the duration of the war to envisage the destruction of the Blitz. After everything I’d expected from the ancient-sounding name, Yeovil seemed an unprepossessing place. Disaffected youths roamed the bland post-war shopping area around the bus station, and there was a feeling that the market town had seen better days. I was beginning to wonder if we were in for a similar disappointment with East Coker. After all, it had been my father who had always told us that we should never go back anywhere. He himself had returned in the 1980s and had been saddened with the changes to the village, and reluctant to talk about the experience. But I consoled myself with the thought that as we had no memories of the place ourselves, there was not the same degree of emotional involvement, and that whatever we might see or experience there would more than likely be a revelation to us. From Yeovil we caught a local bus to East Coker, travelling the way some of the evacuees might have come on September 1st, 1939. 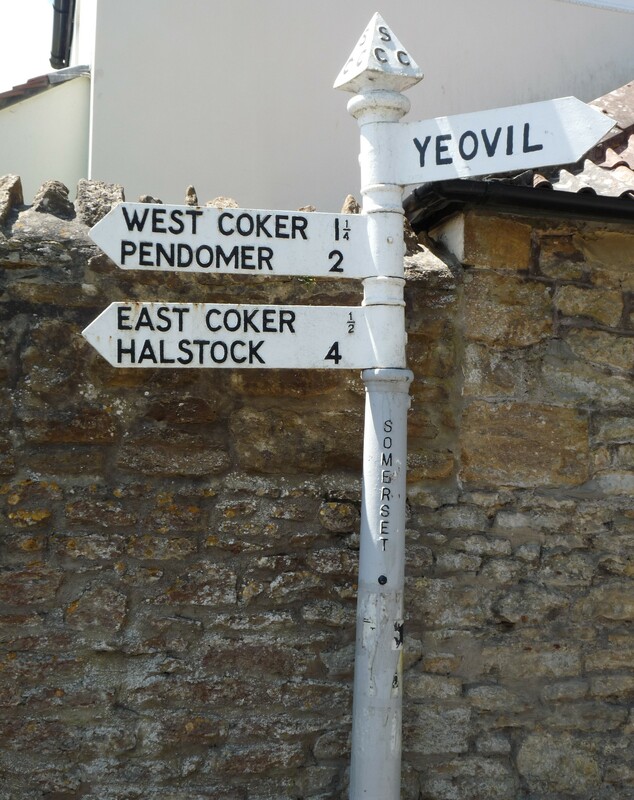 Before long a cast iron signpost – of the kind seldom seen nowadays – pointed us in the direction of East Coker. The bus suddenly veered off down a narrow lane which sunk deeper into the surrounding land the further we travelled along it. Snake-like roots of ancient hedgerows protruded from the sandy soil, while above us the canopy shut out most of the late afternoon sun. 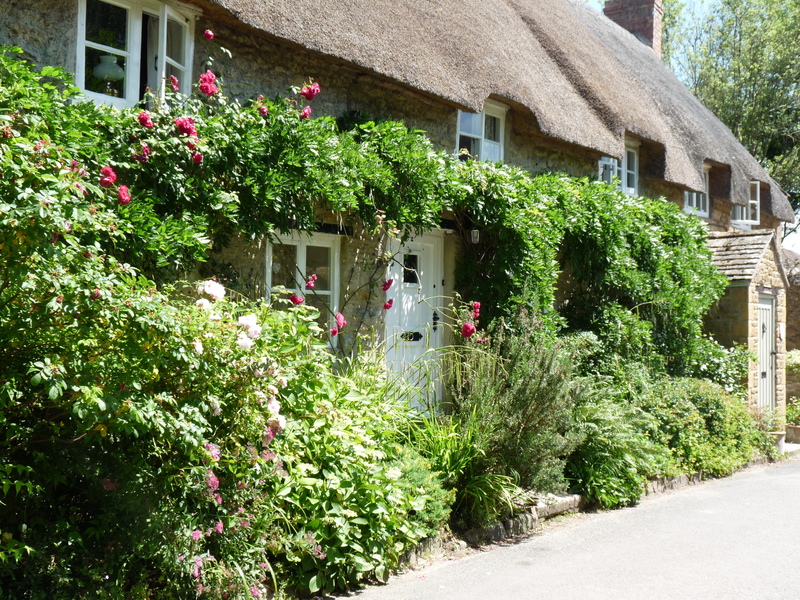 Then we rounded an unexpected corner and came into the centre of the village: a village that looked as if it should not – could not – belong in the twenty-first century. Sunken lanes and cast iron signposts around East Coker. From those first impressions (the patriotic red, white and blue bunting strung up across the main road between the thatched cottages; the alms houses by the church; the hayricks in the fields), to later, more personal information (so this is the farm where Dad once lived; this is the hall where he first went dancing; this is the church where he carved his name in the vestry), we gradually learnt about the modern-day village and its shadowy wartime predecessor. Walking across the damp fields at dusk towards the warm light of the pub on that first evening, it was almost possible to imagine that the past might still exist in some ghostly form alongside the present. 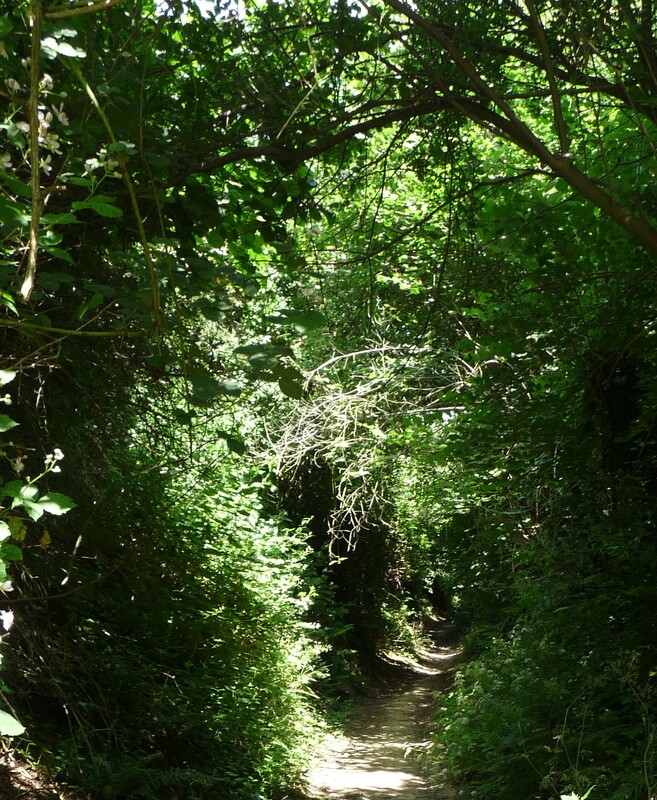 And in the heat of the following day, on a sunken footpath which led from the farm through the woods to the old priory, I lay down, head to the red soil, and heard the drum of distant hooves and the click of mid-summer insects. For those few seconds it felt as if the earth was struggling to gather up the momentum to move backwards, to reveal something to me – until the shouts of children in the playing fields broke through the thick afternoon air. 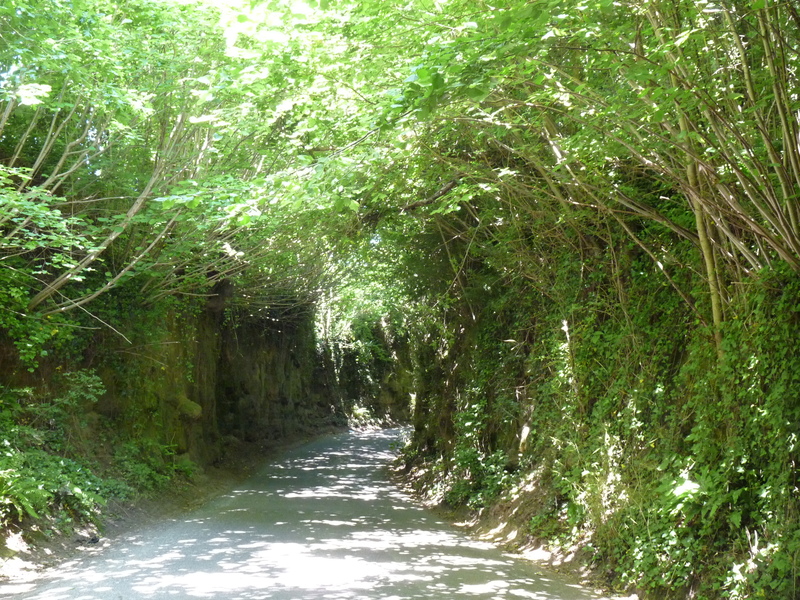 Public Footpath from Burton Lane to Naish Priory. The following day we finally met the boy who had taken the photograph in the woods on Whitsun Monday over sixty years previously. He was manning one of the stalls in the village hall war exhibition, and his table was a jumble of WW2 paraphernalia: old ration books, bits of home guard uniform, various pieces of ammunition. One part of his collection was dedicated to the story of the relationship between the local children and the evacuees. And there I saw it. Amongst the letters and diaries and various bits and bobs of printed memorabilia, was a copy of our own photograph in black and white, mounted in a crude wooden frame. Not trusting myself to speak, I reached into my bag and pulled out my hand-coloured version, and passed it across the table, watching the old man’s face twitch as he struggled to work out the connection. It was then I learnt about that day out in the woods. A moment of late childhood, hanging high and free above the dark shadow cast by the war, and caught on camera like a dragonfly in ether for the dissection of future generations. To be continued next month in East Coker. This entry was posted in East Coker and tagged East Coker, Evacuees on October 1, 2015 by The Incidental Genealogist.